DuPont™ Kalrez®️ perfluoroelastomer (FFKM) parts are the gold standard for chemical resistance and high temperature stability. They offer reliable, long-term sealing performance in arduous applications and aggressive chemical environments where other seals fail. That technology doesn’t come cheap…at least not when it comes to the initial purchase price. You will pay more upfront for Kalrez®️ parts. But can using Kalrez®️ parts actually save you money over the life of your process equipment? The answer is very often yes, when considering the total system cost. While Kalrez®️ parts cost more initially, they can realize significant savings by reducing downtime and seal replacement costs (cost of seal + installation cost). As demonstrated in the following examples, Kalrez®️ parts extend mean time between repair (MTBR). Their proven durability minimizes unscheduled downtime while reducing the frequency of seal changes, repairs and inspections. Plant uptime increases for greater productivity and yield. These case studies take into consideration the frequency and cost of seal replacement as well as the attendant downtime cost. In this case, the seals last for the lifetime of the pump or equipment and so do not require replacement. When considering cost only, FFKM parts can’t be justified. 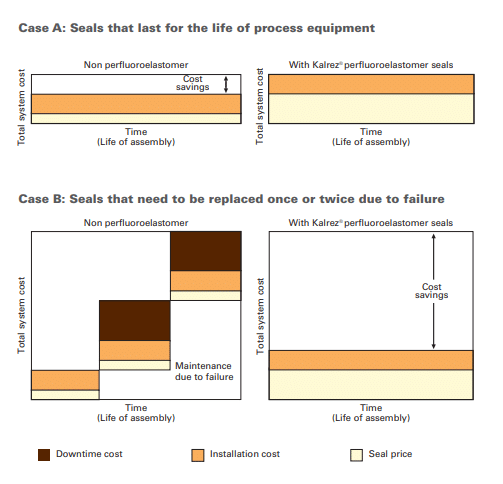 This case introduces the added factor of downtime cost each time the seal is changed. When seals must be replaced due to failure of maintenance once or twice during the life of the equipment, Kalrez®️ FFKM parts could be more cost-effective. In this case, seals must be replaced several times during the life of the equipment. 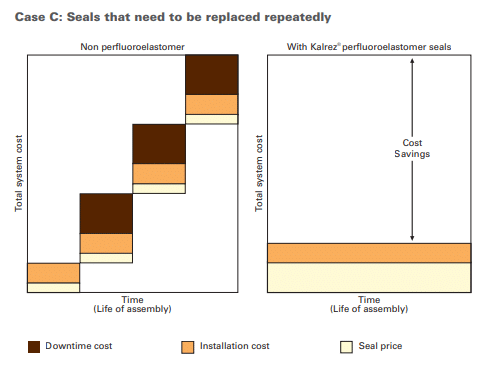 Using a conservative estimate of the service life of Kalrez®️ FFKM parts being four times that of conventional sealing materials, the replacement and downtime costs associated with multiple replacements of the existing seals far outweigh the initial higher costs of FFKM. When seal replacement is regularly scheduled instead of wait-to-fail, the downtime costs incurred in replacing existing seals is usually constant. The cost of switching to more expensive Kalrez®️ FFKM parts should be offset by doubling periods between overhauls. In certain cases, this period could typically be tripled or quadrupled. DuPont™ offers excellent field application examples and additional case studies in this guide. DuPont™ offers a free calculator to estimate the potential cost savings of installing Kalrez®️ parts over your current sealing material. For personal assistance, contact our seal experts at C&B. They can help you find the cost-effective sealing solution that meets your performance and safety needs. We specialize in helping you reduce MTBR and increase plant uptime. Even in conditions that do not expressly demand the chemical resistance and high temperature stability of Kalrez®️ FFKM parts, they can often be the most cost-effective solution due to their longevity. C&B Equipment is proud to be a Licensed Distributor of Kalrez®️ parts. The superior performance of these seals helps you increase your uptime—the mission that guides everything we do. Contact us today for your standard or custom Kalrez® parts.